vintage van, In Suffolk. They are running wild over the fields as I'm busy working on the van. 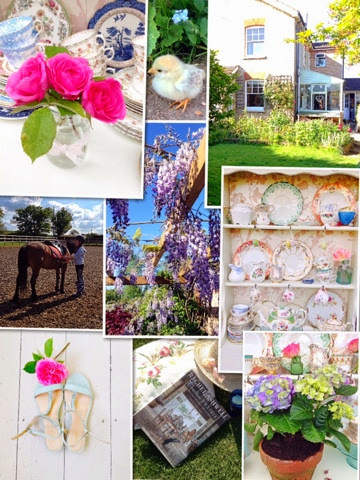 when it's finished, but here in the collage above are some of the simple pretty things I love. about, very slowly restoring our home, after all, why the rush? Watching my daughter ride and seeing her beaming smile as she rides towards me. and pretty. I love re-arranging it on my handed down vintage dresser. The colours mint green and pink, my fave colour combo right now. It's great to have a good inspirational book on what your in to, for me, it's interiors. My couture prairie book is never far from my side (I've even brought it away with me). And last... Hydrangeas... I can always find space for more. make you smile. Enjoy the rest of your bank hols!